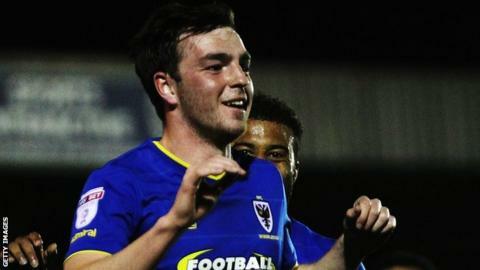 Three goals in five second-half minutes propelled AFC Wimbledon to victory over 10-man Rochdale at Kingsmeadow. At the end of a goalless first half, Keith Keane picked up his second yellow card to leave Rochdale to battle for 45 minutes with a man less. And the hosts made them pay, with Sean Kelly, Lyle Taylor and Dean Parrett all netting in quick succession before Callum Camps grabbed the visitors a consolation. Rochdale were the better side in the first half but were unable to find a way through, and Keane picked up a second yellow card after bringing down Darius Charles on the stroke of half-time. Seven minutes after the restart AFC Wimbledon then went ahead, with Kelly heading home from a corner, before Taylor doubled the lead moments later as he pounced with a close-range finish. And on 58 minutes Parrett thumped home a penalty after Andy Barcham was brought down by Matthew Lund. Camps unleashed a long-range effort after 65 minutes that proved too much for James Shea, who could not keep the ball out, but it was too little too late for Rochdale. Match ends, AFC Wimbledon 3, Rochdale 1. Second Half ends, AFC Wimbledon 3, Rochdale 1. Corner, Rochdale. Conceded by Sean Kelly. Attempt missed. Joseph Rafferty (Rochdale) right footed shot from outside the box is just a bit too high. Corner, AFC Wimbledon. Conceded by Oliver Rathbone. Corner, Rochdale. Conceded by Paul Robinson. Corner, AFC Wimbledon. Conceded by Jimmy McNulty. Delay in match Tyrone Barnett (AFC Wimbledon) because of an injury. Attempt saved. Jake Reeves (AFC Wimbledon) right footed shot from the centre of the box is saved in the centre of the goal. Substitution, Rochdale. Oliver Rathbone replaces Nathaniel Mendez-Laing. Goal! AFC Wimbledon 3, Rochdale 1. Callum Camps (Rochdale) right footed shot from outside the box to the bottom right corner. Substitution, AFC Wimbledon. Dominic Poleon replaces Andy Barcham. Substitution, AFC Wimbledon. David Fitzpatrick replaces Lyle Taylor. Substitution, AFC Wimbledon. Tyrone Barnett replaces Tom Elliott. Substitution, Rochdale. Andrew Cannon replaces Joe Bunney. Substitution, Rochdale. Joseph Rafferty replaces Matthew Lund. Goal! AFC Wimbledon 3, Rochdale 0. Dean Parrett (AFC Wimbledon) converts the penalty with a right footed shot to the bottom left corner. Penalty AFC Wimbledon. Andy Barcham draws a foul in the penalty area. Attempt missed. Tom Elliott (AFC Wimbledon) left footed shot from the right side of the box is close, but misses the top left corner. Goal! AFC Wimbledon 2, Rochdale 0. Lyle Taylor (AFC Wimbledon) left footed shot from the centre of the box to the bottom right corner. Assisted by Tom Elliott. Goal! AFC Wimbledon 1, Rochdale 0. Sean Kelly (AFC Wimbledon) header from the centre of the box to the bottom right corner. Assisted by Dean Parrett with a cross. Corner, AFC Wimbledon. Conceded by Harrison McGahey. Second Half begins AFC Wimbledon 0, Rochdale 0. First Half ends, AFC Wimbledon 0, Rochdale 0.